I specialize in pain and stress relief, and you deserve to feel your best! With a combination of Swedish relaxation massage and gentle stretching, we’ll work out all those kinks and knots, even the ones you didn’t know you had. Don’t forget to ask about adding hot stones to your massage for the ultimate experience in relaxation and stress relief! You’ll not only leave feeling better than you ever imagined, but you’ll also want to come back as soon as you can! We all carry our tension and stress in our necks and shoulders, and most of us spend too much time sitting at a desk at work to boot. Using a keyboard and mouse all day just makes it worse, with the constant strain of keeping one arm in an awkward position and our eyes fixed on the computer for hours at a time! This specialty massage targets those tension areas and eases your stress and pain — you’ll enjoy blissful relief from stiffness, headaches and discomfort. Your neck and shoulders will be more relaxed, flexible and free of pain than they have in years! Old injuries; sitting at a desk or in a car for too long; inadequate stretching or exercise; and plain old stress and worry: Too many of us have forgotten what it’s like to be free of pain and tension! I can change that for you with a massage concentrating on your back muscles—both the upper back muscles that store so much tension and stress, and the lower back that so often gets strained and injured. With patient, gentle kneading and Swedish massage, I can help that tension, stress and pain melt away, and avoid the soreness or bruising that so often accompanies a high-pressure deep tissue massage. Drop in for a quick tune-up at lunch time or on your way home from work! Let the world wait while you set aside an hour to take care of yourself. 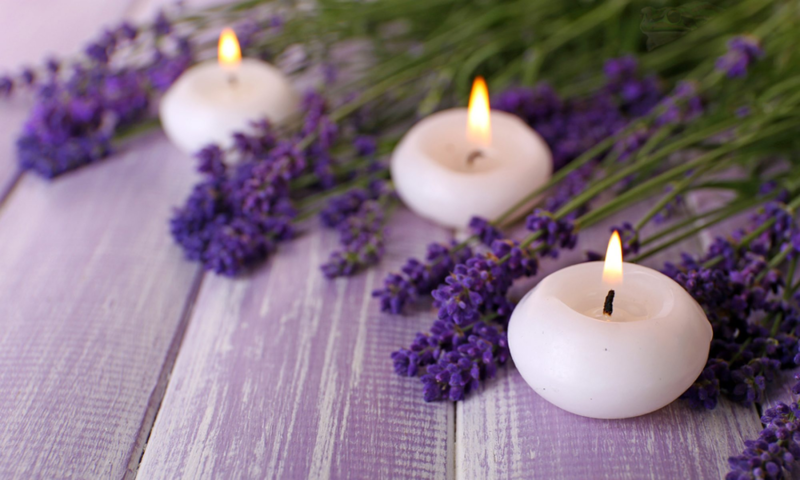 Pamper yourself with the ultimate in relaxation and stress relief! 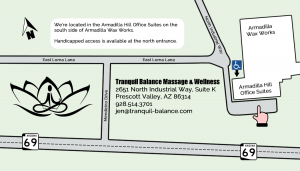 We’re located in the Armadilla Hill Waxworks building on the east side of Prescott Valley! 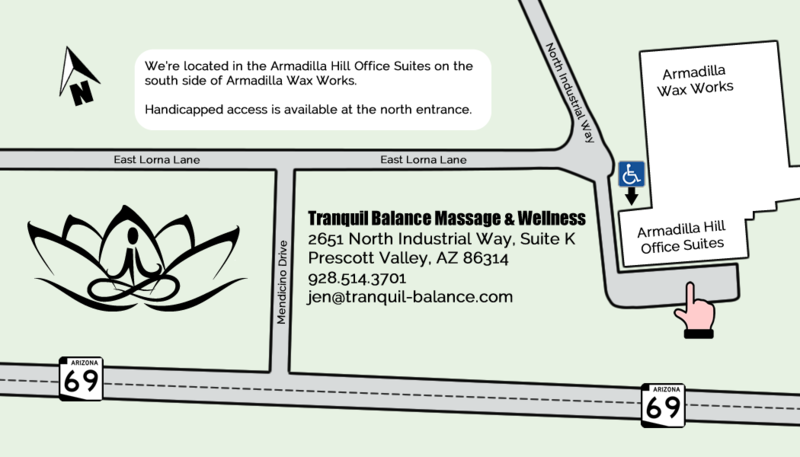 The office suites have two entrances, one on the north side and the other on the south (see the map below).